As I was browsing the internet, I saw with interest Michael Jackson's (sic) children appeared at his funeral without their usual veils. I tried to check out the news photos so I could see his little darlings. I found this picture (below) and thought to myself, "Indeed here they are!" But then I saw the next picture in the slideshow and thought to myself, "Maybe those are his kids." 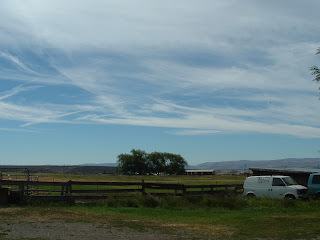 Crazy chem trails over Ellensburg, Washington. What do you guys think? Totally naturally occuring clouds - just coincidentally appearing when large jets fly over leaving thick long lasting con trails? Strange occurances from aliens bringing disease and plague? Patented attempt to combat global warming without cutting comsumption? Otherwise just enjoy the free show! And a good day to you. Big smile. I deliberately stayed away from the news yesterday because I wanted to avoid this circus funeral. I can't begin to weigh the damage to those poor kids going from hiding behind veils to being stuck in the limelight. The little one is carrying a MJ action figure. How weird is that? cube - it is weird on so many levels - a michael jackson action figure? okay that's just bizarre. imagine carrying a litlle plastic version of your father to his funeral. haven't we felt sorry for those kids since they were born? and their new mothers - grandma and/or diana ross? yikes! I think it's alien graffiti. Are those dogs or foxes? Wow the littlest is a ringer for his eyes. I'm not making it up. It's in the photo. I don't know if it's a MJ action figure or doll (whatever they're called these days), but he's carrying one. Ananda Girl: I think those foxy little guys are fennecs. So cute. I think I love their oversized ears the best. ananda - graffiti, eh? and indeed mis cube is right, they are fennecs. so if the little one - blanket - has his eyes, did he have plastic surgery, too? What are those animals with the incredible ears!!!?? I need these creatures. NEED! Poor kids...they are beautiful children, no matter who they actually belong to. Sebastien - Again - Welcome! It sounds like you're in luck to nab a fennec fox if you sneak into laura b's library in a few days! Imagine having one at your place of work. Marvelous. By the way, I think you may have confused the meaning of the word NEED for the word WANT. I'm not sure; it's just a hunch. laura - they are beautiful children. so sad. and how lucky for you to have a visiting fox in your library. Do you work in the best place, or what? Shoot. I can't stop laughing at the doll now. ananda - it was a total bonus - cube sure has a sharp eye, yes? can you believe the handlers didn't make sure the doll was dressed? Sebastien - Oh my gosh - you are funny! Again - I guess you need to check in with laura b about how to get one for yourself. Good luck on that one!